There are so many great historical documentary films out there. PBS and Ken Burns come to mind immediately as producers of the the best ones. However, there is a fine line between learning from a film and sitting in the classroom while a film plays. Many students, often unintentionally, miss key parts of documentaries showed in class simply because it is hard to maintain undiverted attention to the screen. Here are a few strategies to help solve that problem. A few months ago I wrote about my first experience with backchannel in my classroom. Since then I've used the strategy many more times and each experience has been better for my students and myself. This strategy works best for longer screenings that last at least half the duration of a typical class period. respond to questions you pose to them. We can ask questions while we watch and the teacher can answer them right away. So we get more immediate feedback. Sometimes when you watch a movie you forget stuff because you can't take notes all the time on your own. With backchannel you have everyone's notes right there to look at. Socrative is a live response app that is available via web browser or mobile app across all platforms. It behaves like an advanced clicker system that can be utilized with existing devices in the room. I use it to facilitate class discussion, to allow students to share their ideas with each other and vote on the best one, and to check for student understanding all the time. Create a teacher account on the Socrative website or using the teacher version of the app. You can also customize your room number so that it makes sense to your students when they log in (mine is Gallagher341 - my last name and the my physical room number at my school). Students either access Socrative through the website or by downloading the student version of the app. 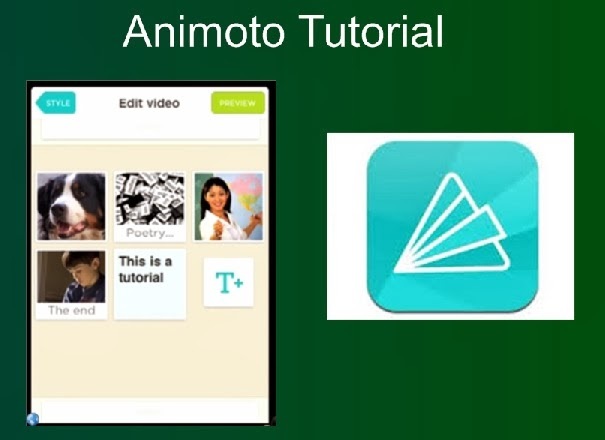 Cue up a series of short video clips for students to watch. Instruct them to check in on Socrative and answer the questions you've prepared after each clip and before starting the next. Students can watch the videos and take the intervening quizzes at their own pace on their mobile devices with earbuds during class or at home in a flipped model. It's hard to watch video and write at the same time. The breaks between short clips and Socrative questions helped me check in for my understanding. We don't miss information during the video because we aren't distracted by taking notes while viewing. 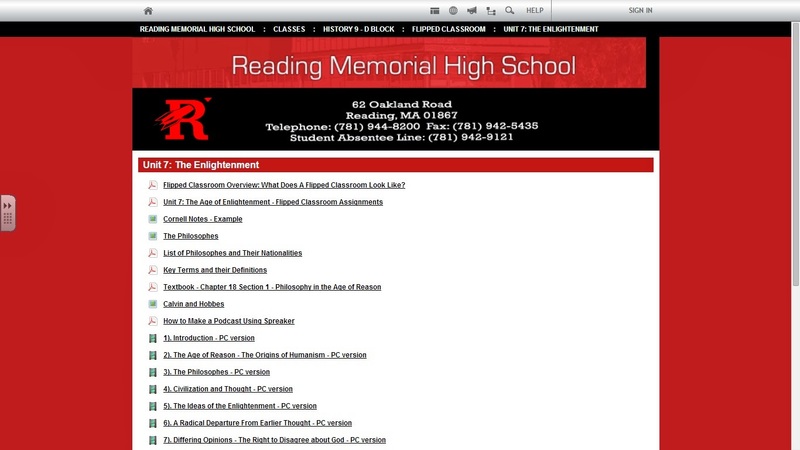 eduCanon allows teachers to use any YouTube or Vimeo video and add interactive questions. 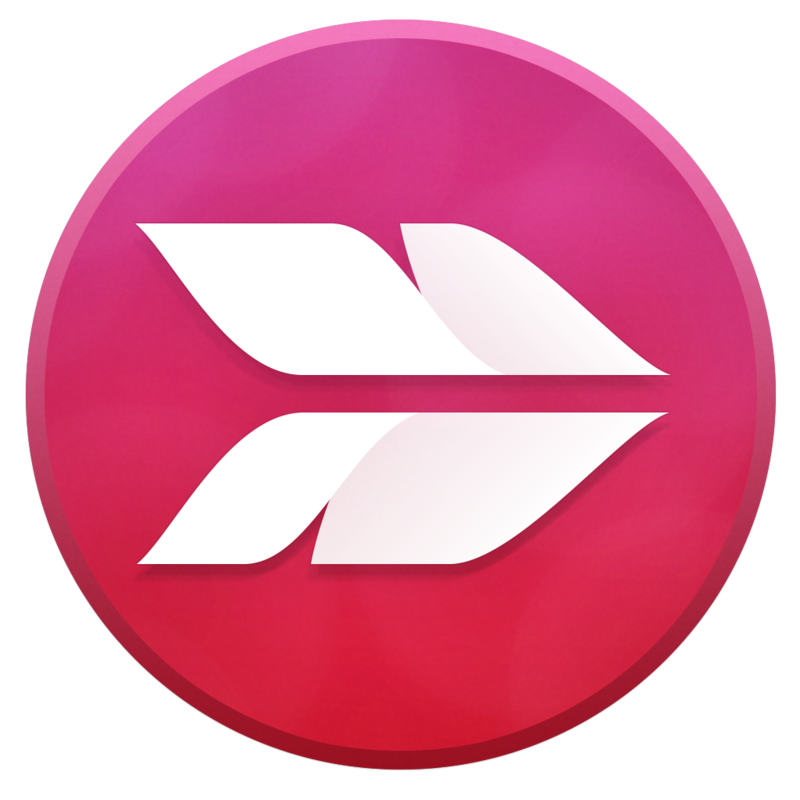 eduCanon will automatically pause the clip and give students time to think before moving on. If you assign this on the flip for home viewing, you can check to see who watched the video during the evening as well. You'll also see which questions they get right and wrong and which they went back to fix. You can even have students sign up to join your class and monitor their progress live in the evenings. If there are questions that students struggle with, you can be sure to take the time to review that content in class. Here is an example of one I created on the Restoration and Glorious Revolution. It felt dynamic and engaging. We were able to work individually at our own pace. It made it easier to understand the video because of the questions popping up to check on me. All of these strategies have been road tested in my classroom. Students have been more engaged than ever while viewing film and I have found that they retain the information better when I'm using these tools. The student feedback you read above are really my students' words. The Friday before a week-long February Break... deadly for student engagement. Add to that a Thursday snow day that threw any momentum we had accumulated out the window, and I needed a miracle. Thank goodness for BYOD and mobile devices. 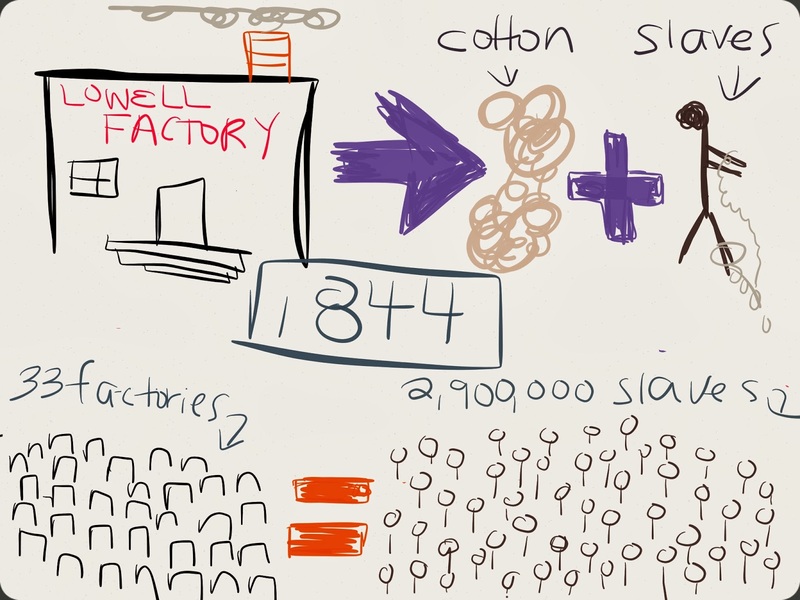 Students were learning about the American Colonization Society to wrap up our unit on Antebellum Slavery. 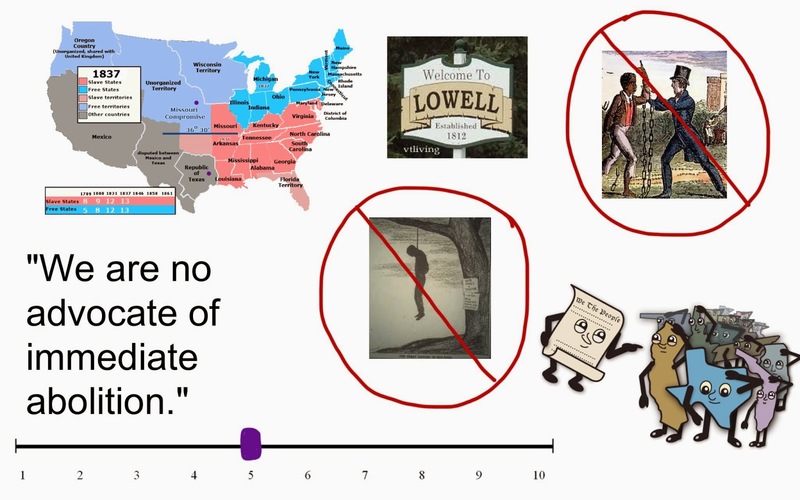 The racial divide that defined both the social and economic structure of the United States in the early 19th century is hard for my teenage students to comprehend. Primary source analysis is the best way for them to learn the different perspectives of the era. During the creation process students were engaged: learning the necessary apps, but more importantly, talking about the primary source text. They were debating about the intentions of the writers, and they were preparing to defend their conclusions to their peers when they would be presenting their final creation during the last 10 minutes of class. I tweeted what I saw as I walked around the classroom monitoring their progress. 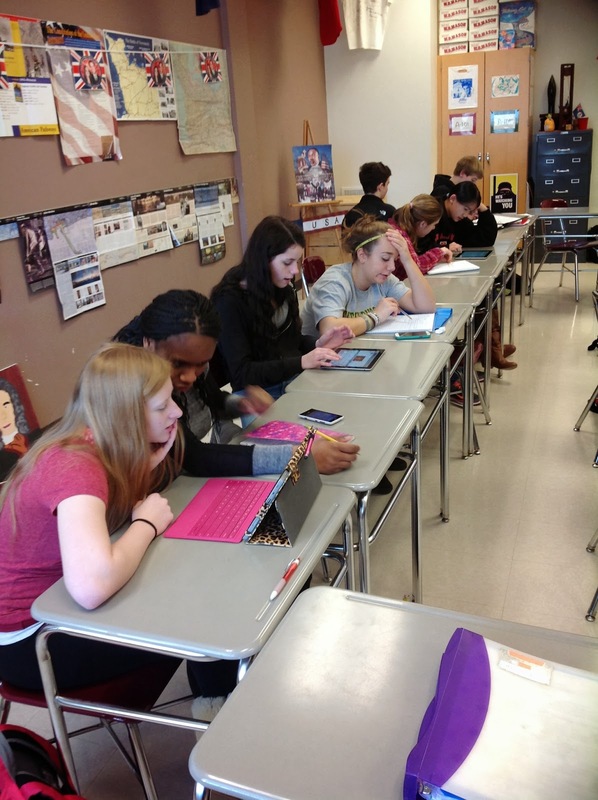 My tenth graders used a combination of school-owned iPads and their own devices on our BYOD wifi network. There were a variety of smartphones, tablets, and laptops at work throughout the classroom. 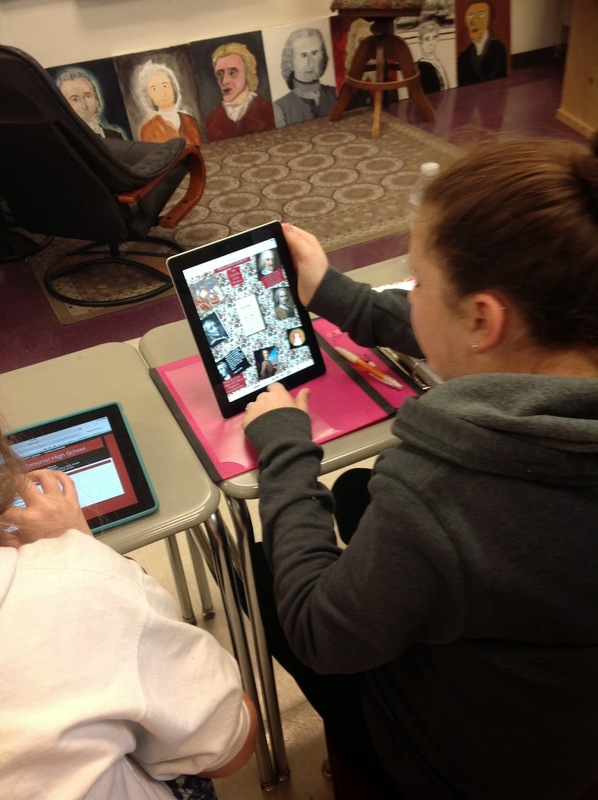 Chatter Pix is a free app and it does not require students to create accounts for them to use. The resulting videos can be easily saved to the camera roll of a mobile device and then shared with others via email or social media. 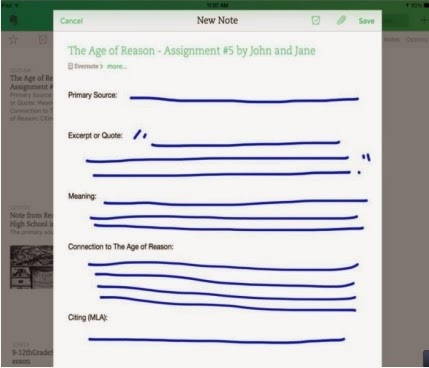 There is also a kids version that allows you to add more restrictions on student use. Students in Group A for each document had to make the author come to life and explain his perspective. Their challenge was to distill the main idea of a relatively complex primary source to something that could be read aloud in 30 seconds or less. 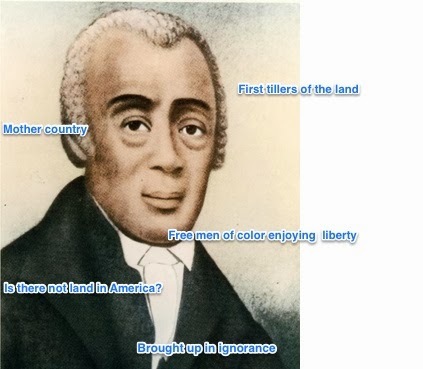 Here are their results with both Madison and Allen explaining their opinions on the colonization of free blacks themselves. 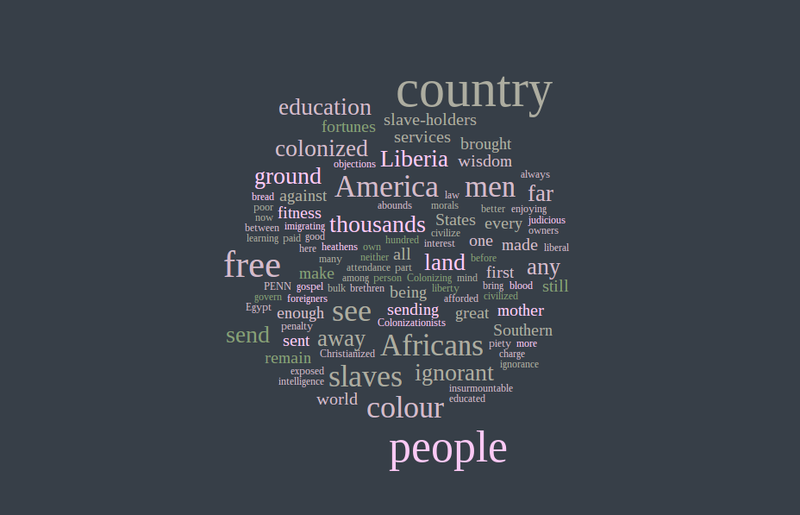 Word clouds are a great way to analyze primary sources because words that the author uses most often are enlarged as compared to words that are used less. It is an interesting way to discover the priorities of that author. Other word cloud tools require Java or Flash and are therefore impossible to use on iPads. WordItOut works well on all devices through the web browser. Students in Group B had to copy and paste their entire document into WordItOut and then write a short analysis of the resulting word cloud. The captions are the students' words. 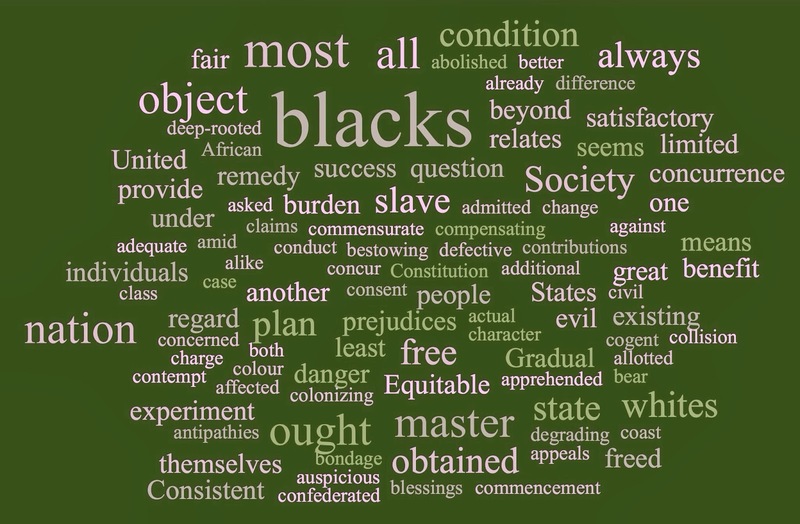 Some of the most prominent words that appeared on our word cloud were blacks, fair, society, colonizing, object, and prejudices. 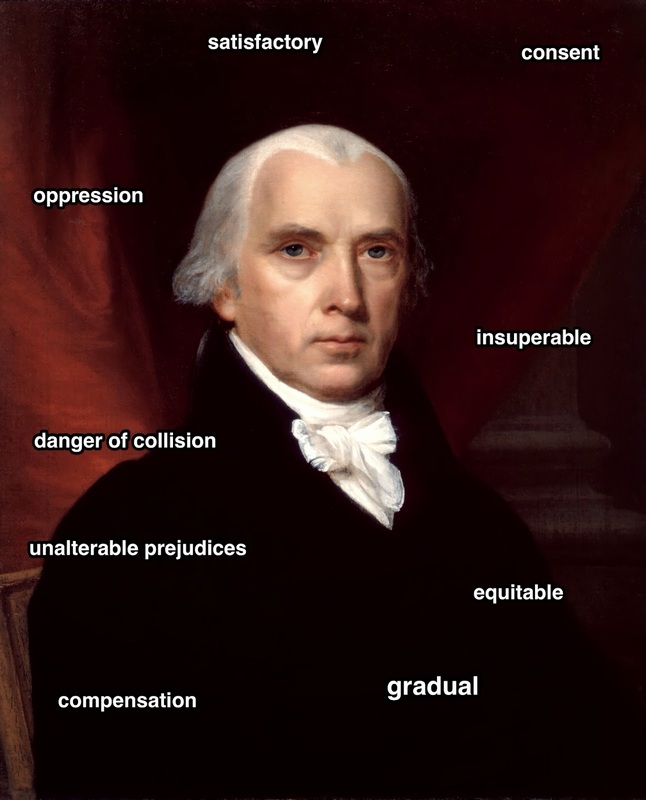 This is significant because it shows how much James Madison and the American Colonization Society focused on race and how they believed that white population could never overcome their racial prejudices. 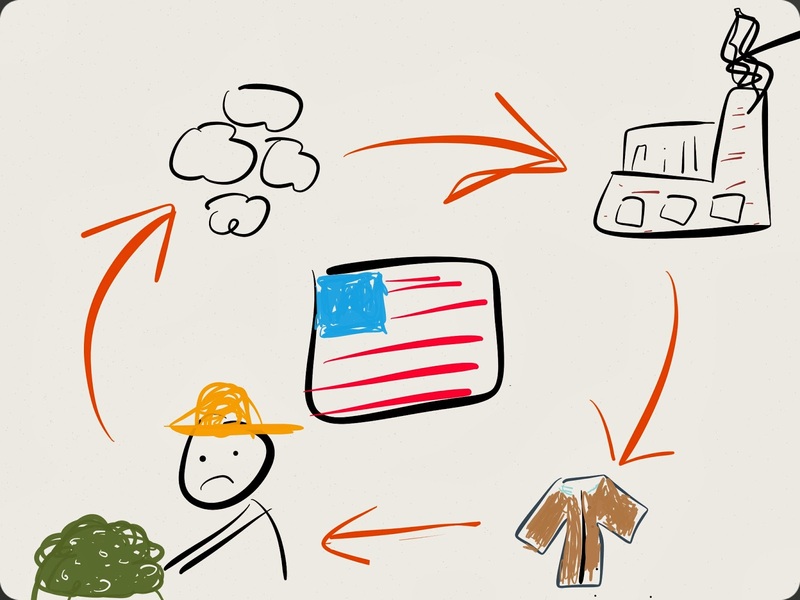 Slaves - It is unjust that the free must leave and slaves must remain in the U.S.
We have used Skitch a lot this year. 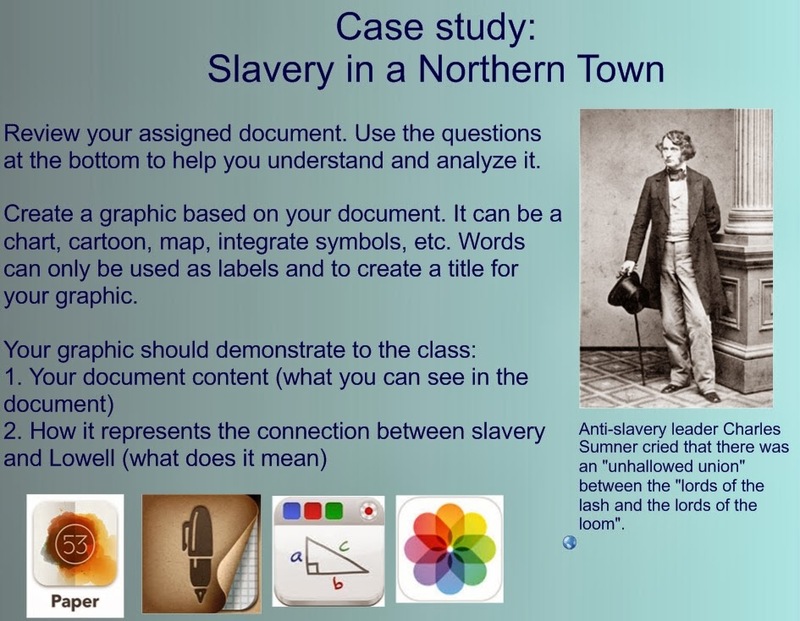 Students have annotated primary source images, artwork, maps, charts and graphs to show what they've learned from them. 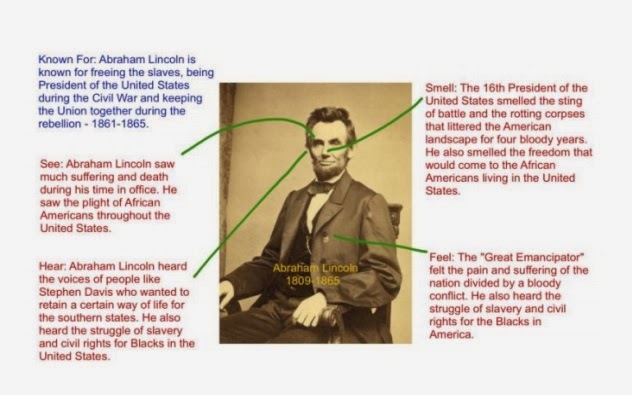 Students have gotten quite good at it and have even added their annotated sources to their Evernote paperless notebooks as part of their record of learning for our history class. We found a new way to use it for this class activity as well. Group C found a portrait of their author and then surrounded his head with key words they chose from the primary source to demonstrate the main idea. The caption below is the student analysis. 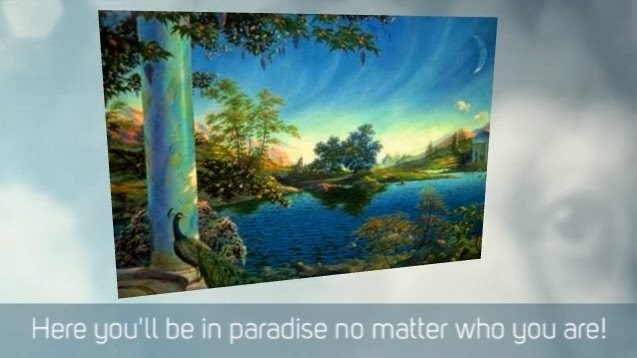 We used the word satisfactory because he wanted to satisfy the slaves in new lives and the master after losing their property. The word oppression is relevant because he wanted to have the whites stop oppressing the black people. We used the word gradual because he believed that the change from slavery to no slavery should be gradual. Danger of collision is referring the possible negative effects free blacks and whites in the same society. Compensation was needed for whites who lost their slaves, and he thought it was good to have the consent of both parties to free the slaves. This was just my own little way of keeping students engaged and learning about history on a day that traditionally would have been a struggle due to a loss of momentum and an impending vacation. They had spent 50 minutes reading, discussing, and creating. 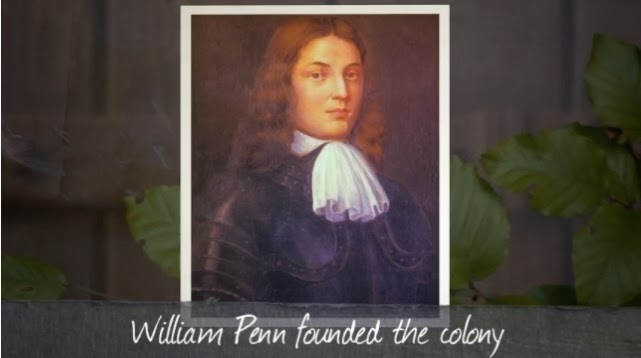 When the bell rang, they left happy and had learned the conflicting historical perspectives on the American Colonization Society. My students and I have tried a lot of different discussion formats in my class: Socratic Seminar, informal Q & A, bean bag toss, and everything else I could think of over the years. Some were too formal and students were almost too nervous to participate. Others were in groups that were too large and not everyone was heard as much as they would have liked. Sometimes the success depended on the time of day: morning classes were super quiet while afternoon classes were hard to control. In all cases, discussion was framed around teacher goals and not around student inquiry. 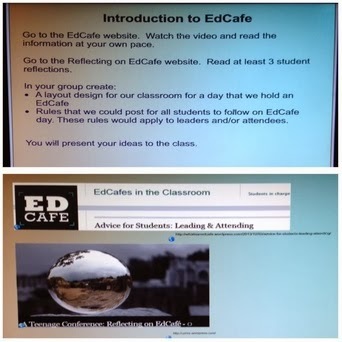 We recently tried the EdCafe model. EdCafe solves all of these problems. The ultimate authority on EdCafe is Katrina Kennett, she is the creator of the What is an EdCafe? website. Within the website there is a guide for teachers and a guide for students. There area also contributions from other teachers (like Alexandra Horelik) who have created graphic organizers, rubrics, and other resources that can help you with your EdCafe. 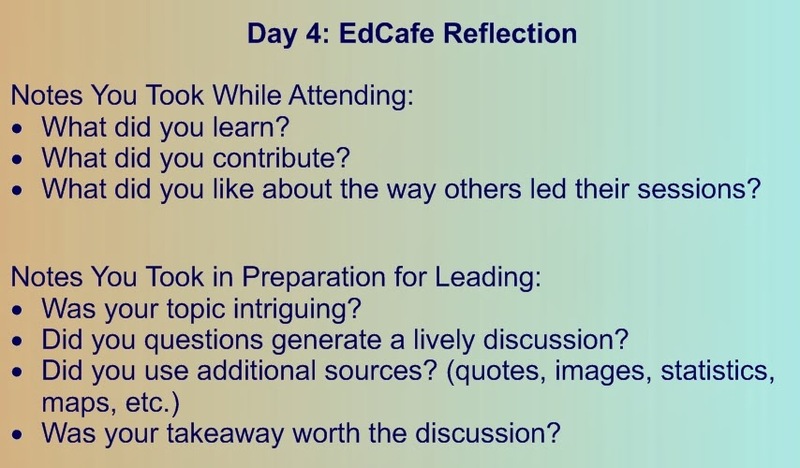 If you are on Twitter, follow the #EdCafe to see how other teachers are using it in their classrooms. I assigned a few readings around a common theme. 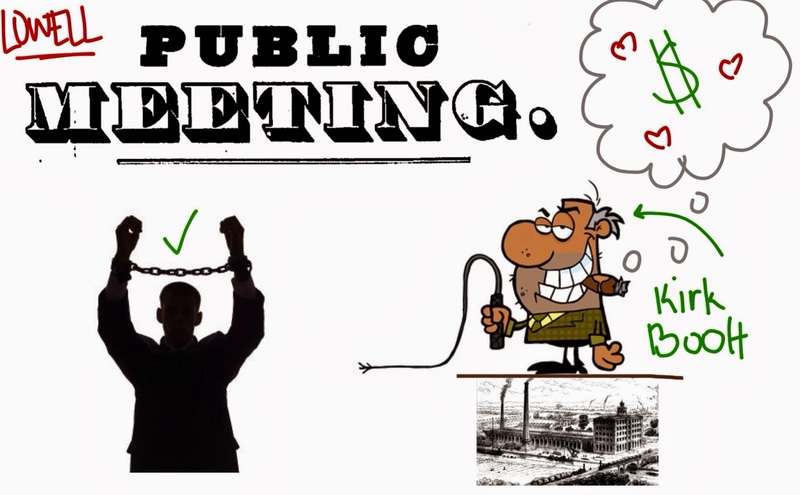 Our curriculum, in part, includes 19th century American history and so we read slave narratives and watched a short documentary with stories of real slaves' lives. Students were given a reasonable time to complete the reading outside of school. You could even simply teach the first half of a planned unit and then hold an EdCafe to see what questions students have about what they have learned so far. 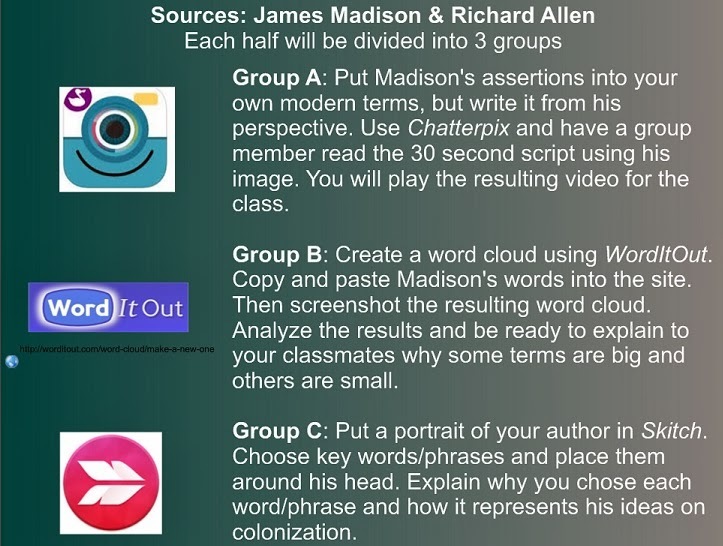 I gave my students a webquest-style activity to familiarize them with the EdCafe style of discussion and learning. They watched the EdCafe video for students and read the Advice for Leading and the Advice for Attending. Then they went to the Teenage Conference: Reflecting on EdCafe website and read a few of the student reflections. This helped them understand what other high school students thought of the experience. It also helped them identify common pitfalls to avoid when they had their own EdCafe. The video helped them get a feel for how they might utilize the space in our classroom. 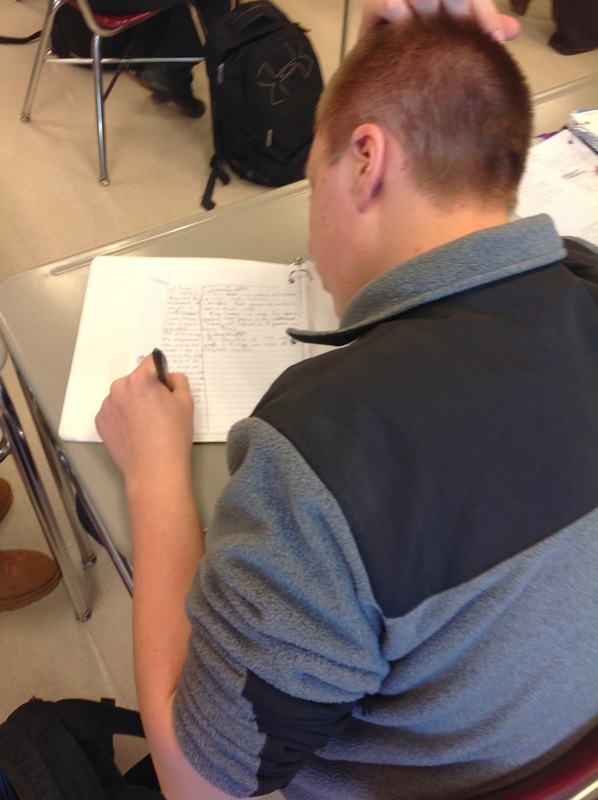 The Advice information and student reflections helped them learn about how they should conduct themselves and what they might expect of their classmates. Based on what they learned the set the rules and designed the classroom layout. Students decided to lead their first EdCafes in pairs. They got together and compared their notes on the readings. I gave them access to a graphic organizer to help them plan their EdCafe session based on this one from Alexandra Horelik. Once they had chosen their topic and written 7-10 open ended discussion questions that would help their EdCafe attendees to dig deeper, I signed them up for a time slot and location for our EdCafe day. 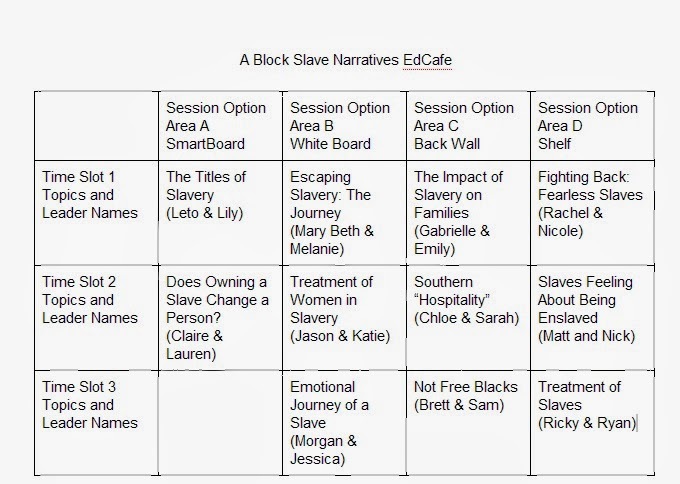 I made the schedule available as a Google Doc so students could look at the session topics that night and get a feel for which EdCafes they might want to attend. Students who signed up to lead an EdCafe session near the SmartBoard or the white board in my classroom were expected to plan to use those resources. 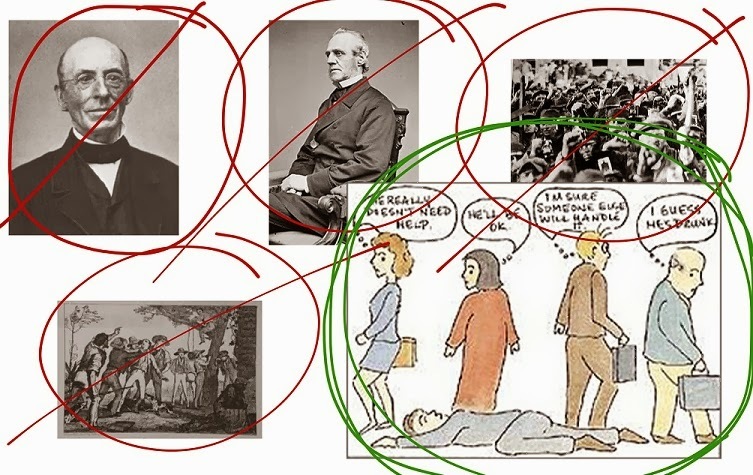 Some came prepared with primary source images to project on the screen, some drew and filled in Venn Diagrams based on their discussion, some created concept maps. Our four session leader pairs for Time Slot 1 gave 30 second introductions aimed at persuading their classmates to attend. Leaders launch into their 1 minute background speech to explain their topic in more detail to their attendees. The discussion begins! Attendees and leaders ask and answer each others' questions. The leader makes sure talking doesn't die down to an awkward silence with their 7 to 10 open ended questions. At the end of the session, the leader gives a 30 second explanation of their EdCafe takeaway. 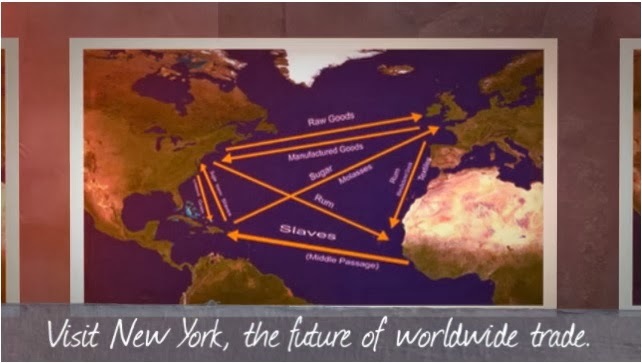 This could be new understandings the group reached or new questions that came up. We repeated this process three times in one class period. Students left with lots of notes and lots to think about. I asked students what they thought of our first EdCafe experience. They had a lot to say and there was controversy. The aspects that some students liked about EdCafe were the same aspects that others weren't sure about. There was a lot of talk about how leading and attending were different experiences. Some wanted the sessions to be longer next time. Others wanted them to be shorter. Some wanted to try to lead on their own, others liked the comfort of having a partner to fill in gaps. A lot of them argued that since it is called an EdCafe, I should allow them to bring in baked goods next time (of course)! After a 10 minute discussion I asked them to reflect on the experience and on what they learned on their blogs. Since our class is paperless, this is how they submit most of their work and it seemed like the best way for me to assess them on it. 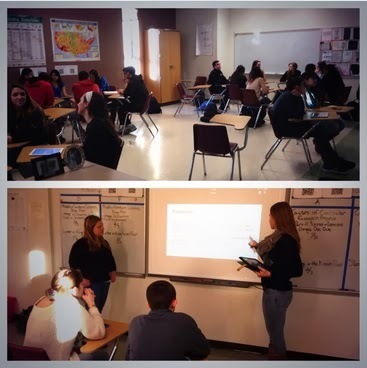 "The main idea of an EdCafe was to allow students to have the chance to talk about certain topics in small, informal groups, without the awkwardness of a Socratic Seminar. In my opinion, the EdCafe went pretty well in our class." "It taught me a lot a lot about slavery and I liked that we were able to lead our own discussion, because sometimes its hard to get a chance to say what you want when you’re in a large group." "I also liked how we got to do it with a partner and how we had freedom in choosing what discussion to attend." They also had suggestions for next time. Some are ideas for self-improvement. 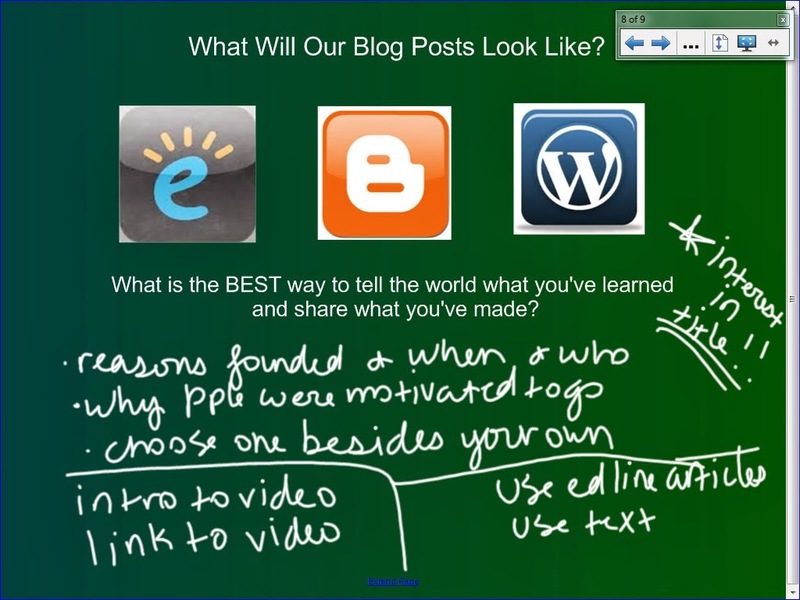 Others are general suggestions on how the EdCafe should be structured. Since EdCafe is all about student choice and student discussion, I will likely implement some of their suggestions and see if they see the improvements they're hoping for. "I noticed that at certain times, one group would be overflowing with 10+ attendees, while another had only two. Larger discussions, I noticed, flowed smoothly and were not as awkward as the smaller ones, and they did not require as much prompting. As a future recommendation, I think that having a maximum of 8 people (for three groups) and a max of 6 (for 4 groups) would work well to help balance it out." "What I could improve for the next time is I will have more questions. That is because this time my group finished the questions with a few minutes left and we had to repeat going over the same questions again." "The class could have been better on coming up with different ideas on the subject, I felt that several of the ideas and subtopics were repetitive and could have been more unique." I will definitely use the EdCafe again. My students have lots of questions and ideas that don't get air time during a normal class period. Students' academic experience should be just as much about what they are required to learn (based on curriculum and Common Core) as it is about pursuing the ideas and controversies that fascinate them. EdCafe provides a place to balance all of these priorities.